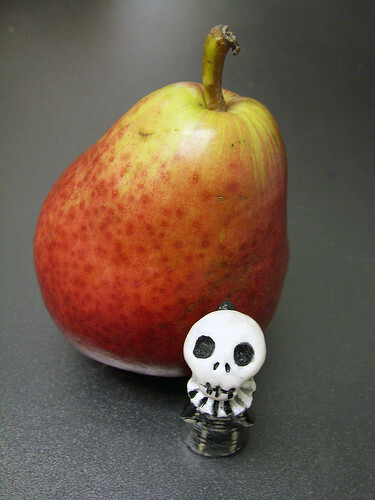 Skelly (the poppet) has a comice pear with lunch. Ok, maybe it wasn’t Skelly that had it…maybe it was me! pays to be up this late at night…I am sure to pay for it tomorrow. But I say a row of mathes! final guess…matches…I will even go so far as a mobile shout out….matches. Am I right, or should I just haul my a$$ to bed! They look like matches to me. Maybe those huge ones for a fireplace? Cozy!!! matchstick heads… didn’t anyone tell you not to play with matches?????? Matches for lighting the fires of Mordor. You know, just in case the magic runs out . Robin, you crack me up. I think tops of matchsticks too. I just found you–very cool! !–and my immediate answer was matches!!! I was going to say matches but everyone else beat me too it. So instead I’ll say cuetips that have been dyed red. I was going to say exactly what Jack said. It must be matches, but to go out on a limb, it could be cuetips dipped in red. I want to say matches also but it also reminds me of a hairbrush. I gotta learn to check your site on Tuesday nite, not Weds. midday. I say “matches”, too. Three wooden match sticks! Cool shot! The bloodied claws of a Phoenix? The tops of some wooden matches. the tips of matches, girl! or very well rounded spikes? okay…so Jack and Susan took my guess…q-tips dipped in something really funky/fun/weird….like wax, or something. Actually, we have some medicine thingies for kids that look like those…leftovers, perhaps, from your time here?!?!?! I hope you had a nice Thanksgiving day today. Laura says: Three swollen, red fingers. Cheri says: Three wooden matches.